18-F fluorodeoxyglucose positron emission tomography-computerized tomography (18F-FDG PET-CT) has a very important role in staging, restaging, prognostication, therapy response monitoring, and also in early detection of recurrence in a number of malignancies. It also provides essential information for planning radiation treatment, helping with critical decisions when delineating tumor volumes and residue. Besides, all these, it is the only metabolic imaging testifying the absence of disease in the presence of a residual mass after the standard of care. 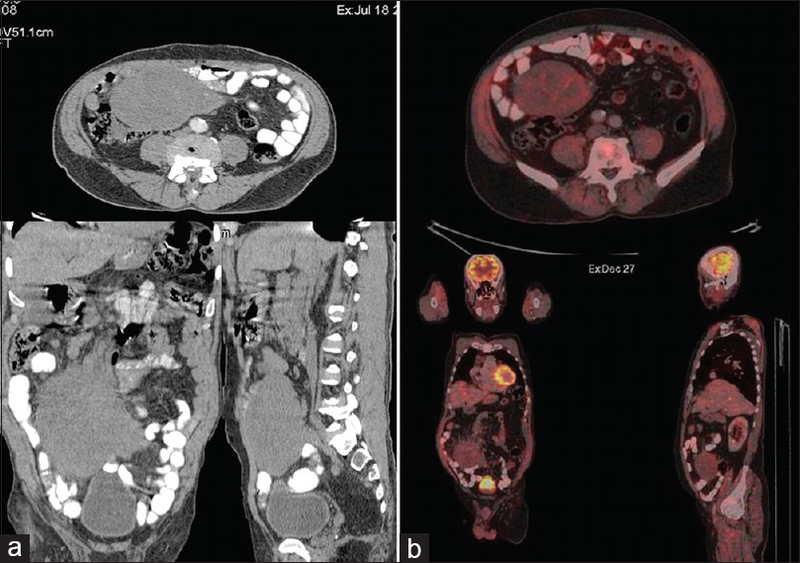 This case series is intended to highlight the pivotal role of FDG PET-CT in differentiating viable tumor mass from fibrotic/desmoplastic residue to enable precise further management. A meticulous evaluation of PET and CT findings with judicious understanding of limitations is mandatory for the optimal utilization of this technique to differentiate metabolically active disease versus nondisease fibrotic residue and to prevent further downstream unwarranted therapy or investigations. A 70-year-old male presented with progressive painless abdominal distention of 6 months duration with no bowel related symptoms or any systemic B symptoms manifestation such as fever, loss of appetite, or weight. 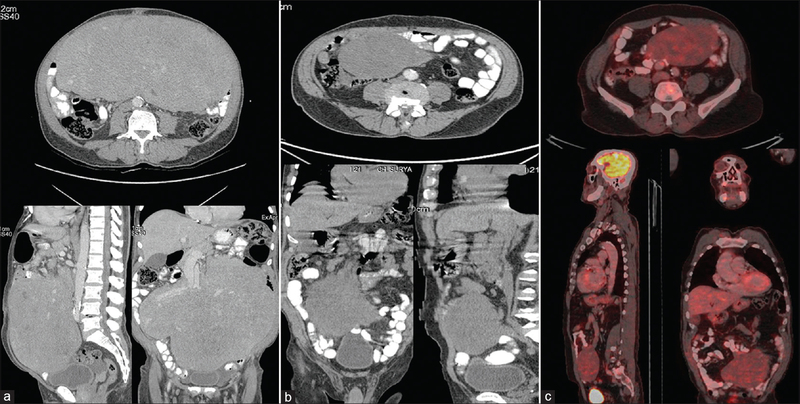 Imaging workup with CT revealed a large mesenteric nodal mass measuring 22 cm × 22 cm × 22 Cm, nonobstructively encasing the mesenteric vessels [Figure 1]a. Trucut biopsy revealing Non-Hodgkin's Lymphoma confirmed on immune histochemistry with CD 20, CD 3 markers. Bone marrow biopsy did not show any marrow involvement. The patient was started on R CHOP regime preceded by prephase induction with steroids in view of bulky disease. Post three cycles of R-CHOP, an interval response assessment was done with contrast CT abdomen which showed regression of the mass to14.1 cm × 7.9 cm × 12.5 cm [Figure 1]b. In view of the morphological response on CT, further three cycles of R CHOP were completed uneventfully with good symptomatic improvement. PET-CT was performed at the end of treatment showed a totally non-FDG avid residual mass 13.6 cm × 7.6 cm × 11.5 cm [Figure 1]c, of similar dimensions as were seen in the interim CT. There was thus a complete metabolic regression with morphological residue of sizable dimension which presumably was a desmoplastic residue than the viable disease in view of the metabolic inactivity and nonprogressive static size. However, a multidisciplinary tumor board deliberation opted for a radiotherapy adjuvant due to the large physical residue and hence radiation therapy of 40 Grey in 20 fractions was also given. Postradiotherapy follow-up with imaging after 6 weeks with a CT-scan abdomen showed the mesenteric mass remaining unchanged in dimensions [Figure 2]a, thus substantiating the premise that disease had complete metabolic remission at the end of treatment with PET negativity, and the morphological residue was only a nondisease desmoplastic component which remains unchanged even after radiotherapy. The patient is on clinical follow-up with symptom and disease-free status. Most recent PET-CT done 1 year after the last review continues to show the same metabolic inactivity and static unchanged morphology [Figure 2]b. A 44-year-old male presented with progressive painless right axillary swelling of 6 months duration. Biopsy revealing Non-Hodgkin's lymphoma. Staging PET-CT revealed an intensely metabolically active right axillary nodal mass, with no other station of lymph nodal involvement nor was any abnormal metabolically active focus identified in rest of the body [Figure 3]a. The patient underwent six cycles of chemotherapy followed by 40 Grey radiation therapy in 20 fractions. The patient was symptom-free, and end of treatment PET-CT revealed complete morphological regression of the right axillary nodal mass with a small ill-defined non-FDG avid, nonmetabolic desmoplastic residue [Figure 3]b. A 44-year-old female with hemoptysis 18 F-FDG PET-CT revealing metabolically active centrally necrotic right upper lobe mass [Figure 4]a diagnosed as small cell carcinoma lung on biopsy underwent concurrent chemoradiation therapy with cisplatin, etoposide and 60 Grey radiation therapy in 30 fractions. End of treatment evaluation with PET-CT revealed complete metabolic regression with a non-FDG avid bland homogeneous residual soft-tissue density in right upper lobe [Figure 4]b with the patient in complete symptomatic relief and disease-free status. A 29-year-old male who was diagnosed with seminoma right testis underwent high orchidectomy followed by three cycles of chemotherapy comprising of bleomycin, etoposide, and cisplatin. End of the treatment PET-CT revealed no residual disease in the right scrotum, non-FDG avid bulky aortocaval nodes at second lumbar vertebral level [Figure 5]a Alfa Fetoprotein (AFP), lactose dehydrogenase (LDH), and human chorionic gonadotropin (HCG) levels were normal. Having completed the standard of care treatment and the patient being clinically disease-free along with nonelevated marker levels and nonmetabolic PET-CT residue was advised noninterventional surveillance. However, the patient reported only after 4 years for review, and a PET-CT revealed exactly similar findings with metabolically inert and morphologically unchanged aortocaval [Figure 5]b and normal levels of AFP, LDH, and HCG. Two years later, PET-CT continues to show unchanged non-FDG avid aortocaval nodes [Figure 5]c and patient clinically and marker wise free of disease. Thus, an evidence-based 6 years' posttreatment temporal follow-up was recorded with non-FDG avid desmoplastic nodal residue in a clinically disease-free and marker negative status. Treatment-related evidence of cure in a solid organ malignancy including lymph nodal disease has historically been objective disappearance of the physical mass on conventional imaging like CT. The persistence of physical form co notates unresolved disease. CT and ultrasonography evaluate the size component reliably, and a subcentimetric nodal size in the short axis has been assigned nonpathological status. However, it is noted on many occasions that nodal size <1 cm harbors disease and size more than a centimeter can represent fibrotic nondisease residue, thus conjuring a dilemma of viable disease versus fibrotic response., 18 F-FDG PET-CT has been able to distinguish between posttreatment fibrosis and viable tumor. 18 F-FDG PET-CT has a higher specificity of 92% versus 17%, and a higher accuracy of 96% versus 63% over CT. PET-CT has been able to address the issue by demonstrating that metabolic regression is a reliable parameter in being able to demonstrate the more sensitive and specific metabolic remission of disease despite the persistence of physical mass. As seen in all the three cases, the persisting mass is factually a desmoplastic residue comprising of connective tissue characterized by low cellularity, hyalinized, or sclerotic stroma. This growth called desmoplastic response occurs as a result of tissue injury or neoplasia and is a tissue reaction than disease mass. The stromal reaction in cancer is similar to the stromal reaction induced by injury or wound repair. The result is an increased extracellular matrix production which spuriously contributes to the total bulk of the tumor. The interaction between cancer cells and surrounding tumor stroma is bidirectional and is contributed both by the tumor and the host tissue. The quantum of desmoplastic reaction is variable, however, some malignancies evoke a higher degree of desmoplastic response especially mucin-producing tumors. Desmoplasia has a number of underlying causes. The mechanism of which is mediated through the proliferation of fibroblasts and subsequent secretion of collagen. A desmoplastic response is characterized by larger stromal cells with increased extracellular fibers. Mitotic solid tumor lesions including lymph nodal diseases are sought with this desmoplastic physical component spuriously adding to the gross tumor volume thus posing a clinical and therapeutic challenge. PET-CT assessment of treatment response in these situations addresses this complexity by discriminating the desmoplastic component from the viable tumor component by its bland nonenhancing non-FDG avid nature, while any residual tumor will be showing varying degrees of FDG avidity. The first case reaffirms this logic by revealing non-FDG avid nature of a fairly large posttreatment residue persisting even after completion of both chemotherapy and radiotherapy. The last case reveals persisting small retroperitoneal nodal residue in a 6 years' follow-up not changing in the size and PET negativity all through. PET/CT in the evaluation of treatment response has overcome some of the limiting factors of CT, which include the size criteria for lymph node involvement, the differentiation of unopacified bowel from lesions in the abdomen and pelvis, and the inability to differentiate viable tumor from necrotic/fibrotic lesions after therapy. The consensus recommendations of the International Harmonization Project 2007 assign a complete response to all patients with a negative PET scan regardless of the presence of a residual mass on CT. In seminomatous germ cell tumors, PET-CT is the best predictor of viable disease in residual masses with a sensitivity of 80% and specificity of 100%, in comparison to CT which has a sensitivity of 70% and specificity of 74%. The recognition of persistence or absence of viable disease in a residual mass especially after the completion of therapy is often intricate. PET-CT by its higher specificity answers this intricate perplexity. Further studies, especially in randomized manner with larger numbers, are required before coming to definitive conclusion of establishing this as a standard of care. However, the findings in these series can be considered as possible guidelines in assigning disease-free status on PET-negative residue. Almuhaideb A, Papathanasiou N, Bomanji J. 18F-FDG PET/CT imaging in oncology. Ann Saudi Med 2011;31:3-13. Bhojwani D, McCarville MB, Choi JK, Sawyer J, Metzger ML, Inaba H, et al. The role of FDG-PET/CT in the evaluation of residual disease in paediatric non-Hodgkin lymphoma. Br J Haematol 2015;168:845-53. Dupas B, Augeul-Meunier K, Frampas E, Bodet-Milin C, Gastinne T, Le Gouill S. Staging and monitoring in the treatment of lymphomas. Diagn Interv Imaging 2013;94:145-57. Cremerius U, Fabry U, Neuerburg J, Zimny M, Osieka R, Buell U, et al. Positron emission tomography with 18F-FDG to detect residual disease after therapy for malignant lymphoma. Nucl Med Commun 1998;19:1055-63. Kumar V, Abbas AK, Fausto N, Aster JC. Robbins & Cotran Pathologic Basis of Disease. In: Stricker PT, Kumar V, editors. Neoplasia. 8th ed. Pensilvania: Elsevier; 2010. p. 258-330. Cheson BD, Fisher RI, Barrington SF, Cavalli F, Schwartz LH, Zucca E, et al. Recommendations for initial evaluation, staging, and response assessment of Hodgkin and non-Hodgkin lymphoma: The Lugano classification. J Clin Oncol 2014;32:3059-68. Delbeke D, Stroobants S, de Kerviler E, Gisselbrecht C, Meignan M, Conti PS, et al. Expert opinions on positron emission tomography and computed tomography imaging in lymphoma. Oncologist 2009;14 Suppl 2:30-40. De Santis M, Becherer A, Bokemeyer C, Stoiber F, Oechsle K, Sellner F, et al. 2-18fluoro-deoxy-D-glucose positron emission tomography is a reliable predictor for viable tumor in postchemotherapy seminoma: An update of the prospective multicentric SEMPET trial. J Clin Oncol 2004;22:1034-9.